U.S. Secretary of State, Rex Tillerson’s first diplomatic visit to Moscow did not result in any significant breakthrough in bilateral relations: There are currently too many differences in the two countries' approaches to various problems. However, experts stress the importance of the fact that the two nations are at least talking to one another. Russian-U.S. relations are currently in a very poor state, Russian President Vladimir Putin admitted shortly before talks between Russian Foreign Minister Sergey Lavrov and U.S. Secretary of State Rex Tillerson in Moscow. In an interview (in Russian) with the Mir 24 TV channel, Putin said that during the first several months of Donald Trump's presidency, the level of trust between Moscow and Washington had further "deteriorated," compared even to the last years of Barack Obama's presidency when political analysts believed that the two countries were returning to Cold War rhetoric. Prior to Tillerson's visit, the U.S. and Russia didn’t mince their words. Tillerson himself called on Moscow to pick its side in the Syrian conflict. Russia’s Foreign Ministry replied, saying that "bringing ultimatums to Russia does not work." Washington, in turn, published a report alleging that Russia had attempted to cover up the Syrian government's involvement in the April 4 chemical attack. Putin's Press Secretary Dmitry Peskov dismissed the allegations, calling them unfounded. One day prior to Tillerson's arrival in Moscow it was still unclear whether he would be received by Putin in the Kremlin, in addition to the planned meeting with Lavrov. On April 11, Peskov said that Putin's schedule did not list a meeting with the U.S. Secretary of State. However, Putin did eventually come face-to-face with Tillerson on April 12. Kommersant daily reports, citing sources close to the talks, that Syria took center stage. 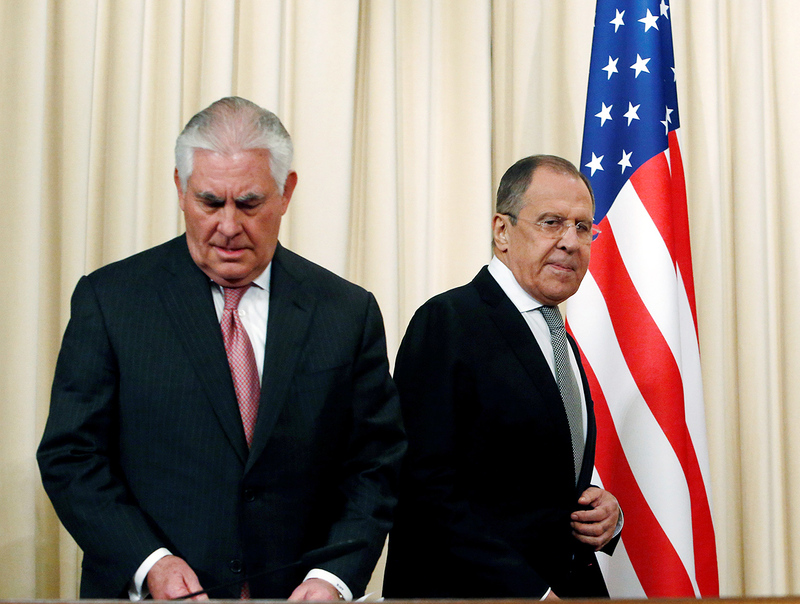 If the statements made by Lavrov and Tillerson at the subsequent news conference are anything to go by, the two countries still disagree on certain aspects of Syria but are prepared to discuss them. Tillerson reiterated that President Bashar al-Assad’s regime is on its way out, and that it is Russia’s responsibility to explain this to its Syrian partner. Lavrov, for his part, questioned the effectiveness of the U.S. war on the Jabhat al-Nusra Islamists: "The suspicion persists that Al-Nusra has been spared so far with the view of attempting, at some point, to use it in toppling Assad." The parties' appraisals of what happened in Syria on April 4 also differ. Washington is confident that the chemical attack was staged by Assad, whereas Russia has given the Syrian authorities the benefit of the doubt, at least until after the Organization for the Prohibition of Chemical Weapons has released its report. Nevertheless, both diplomats described their talks as productive. Lavrov said that Russia is prepared to reactivate the memorandum with the U.S. to prevent incidents and ensure flight safety over Syria (Moscow unilaterally suspended the memorandum following the U.S. Navy's April 7 attack on a Syrian Air Force base). The Russian minister also announced that a special group representing the Russian Foreign Ministry and U.S. State Department will be set up to analyze the existing bilateral problems. Tillerson remarked: "There is a low level of trust between our two countries. The world's two foremost nuclear powers cannot have this kind of relationship." Fyodor Lukyanov, editor-in-chief of Russia in Global Affairs magazine, believes the positive result of the talks was that the two countries restored communications mechanisms: “As for the rest, I did not notice any particular rapprochement; in my opinion, the Americans are now leaning towards a very tough policy, and not just with regard to Russia but overall. For the Trump administration, it appears to be important to demonstrate that America is the boss." Timofey Bordachev, director of the Center for Comprehensive European and International Studies at the Higher School of Economics, concurs that the differences between the nations are too great to speak of any progress. At the same time, he believes there was one side to Tillerson's visit that must have pleased the Kremlin: “For the first time in many years Washington did not attempt to intervene in Russia's internal affairs; Tillerson did not meet representatives of the opposition, his visit was solely devoted to international politics." Lavrov and Tillerson discussed the Korean Peninsula and reconfirmed the two countries' commitment to working towards North Korea's nuclear-free status. Also discussed were Ukraine (the parties stressed the importance of observing the Minsk Agreement) and bilateral cooperation. "Tillerson did not threaten me with sanctions," Lavrov told the news conference. On the other hand, the possibility of the West lifting the current anti-Russian sanctions was not discussed either. Trump, who was meeting with NATO Secretary General Jens Stoltenberg on April 12, reacted to the Moscow talks. He described Tillerson's performance as "awesome," reiterating that it would be good to improve ties with Russia: "It would be wonderful if NATO and our country could get along with Russia. Right now we are not getting along." It should be noted that Trump laid into Russia only a week ago. These contradictory statements coming from Washington indicate that the Trump administration does not have a uniform approach to the country's foreign policy, Bordachev remarks: "The administration is still being formed, there are numerous internal conflicts going on between different groups and individuals. There is still no uniformity in sight."